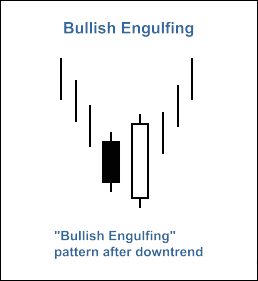 "Bullish Engulfing" reversal pattern forms in downtrend when a small black candlestick if followed by a large white candlestick that completely eclipses ("engulfs") the candlestick of the previous day. The shadows (tails) of the small candlestick are short, which enables the body of the large candlestick to cover the entire candlestick from the previous day. 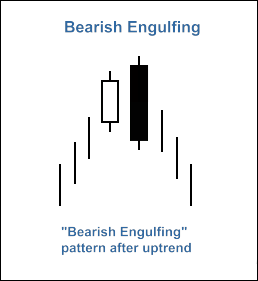 "Bearish Engulfing" reversal pattern forms in uptrend when a small white candlestick if followed by a large black candlestick that completely eclipses ("engulfs") the candlestick of the previous day. The shadows (tails) of the small candlestick are short, which enables the body of the large candlestick to cover the entire candlestick from the previous day. For Short Trade, wait until the RSI is above 70 zone and then look for a bearish engulfing candle to close with the RSI closing out of that overbought zone, and/or RSI establishing lower high. Apply conversely for Long Trade. The formation of "Bullish Engulfing" pattern must be confirmed by RSI indicator: RSI<30 (the value of the RSI of the last completed bar must be less than 30). The short position must be closed if RSI indicator has crossed upward the critical levels 70 or 30. The formation of "Bearish Engulfing" pattern must be confirmed by RSI indicator: RSI(1)>70 (the value of the RSI indicator of the last completed bar must be greater than 70). The long position must be closed if RSI indicator has crossed downward the critical levels 70 or 30. 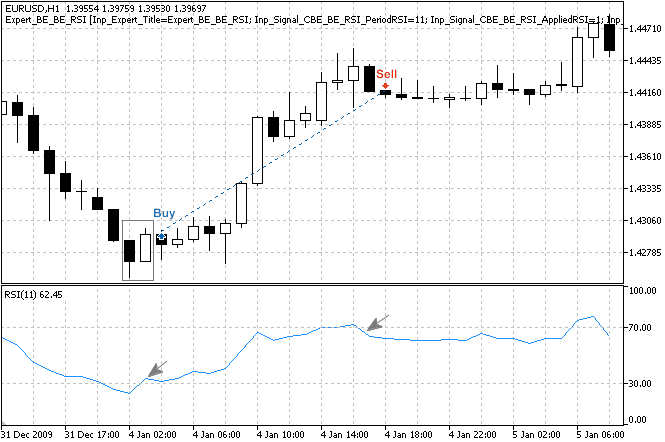 In the picture Bullish Engulfing" and " Bearish Engulfing pattern with RSI forex system in action. I look at an engulfing candle when the price trades beyond the engulfing bar, not just the body. In your example above, you came out too early. If you'd put stop loss below the white engulfing bar, you would still be in long trade. Just a thought:-). Very useful site - thanks.